Parallel to broader coordination strategies, Md. 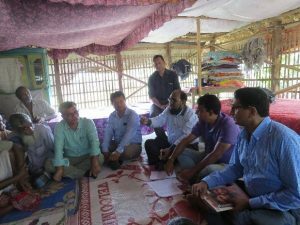 Zakir Hossain Akanda, Additional Secretary (Relief), Ministry of Disaster Management and Relief undertook a field visit to Khulna and Dacope from the 22-24 October 2016. The overall goal of the visit was to firmly position Nobo Jatra as a government supported program and increase ownership of the program at the local administration level simultaneously strengthening buy in from local communities and beneficiaries. A further objective was to meet the Nobo Jatra team including consortium partners World Food Programme and Winrock International at the Divisional office in Khulna, frontline program staff in a working Upazila and subsequently observe tangible Nobo Jatra activities at ground level and also leverage the opportunity to interact first hand with direct program beneficiaries in their local communities. Accompanied by Nobo Jatra senior management, the Additional Secretary travelled to Dacope, a Nobo Jatra working Upazila where the first stop was at the Upazila office allowing the Additional Secretary to meet the field level staff and went on to make the inaugural address at the training for newly recruited Community Nutrition Facilitators (CNFs) and Organizers. During the course of the Dacope field visit, the Additional Secretary travelled to a number of program locations to witness outreach activities at first hand. At Baroikhali village, Pankhali Union, a community meeting was observed. Large scale beneficiary registration is a huge Nobo Jatra priority with all frontline program staff across all four Upazila’s fully engaged in the data collection process. The Additional Secretary was able to observe the methodical and thorough registration process including the verification and triangulation measures undertaken by Organizers and Facilitators in Poshurdham Village, Laodob Union. Upon return to Khulna, the Additional Secretary visited the Nobo Jatra Divisional office in Khulna where he was able to meet and address the Nobo Jatra team including management from WFP and WI. 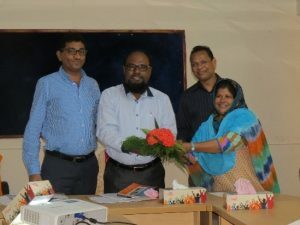 As part of bilateral engagements and in adhering to the objective to strengthen local administration ownership of the Nobo Jatra program, a meeting was held with the Khulna Divisional Commissioner, and Khulna Deputy Commissioner and Magistrate. The Union Nirbahi Officers from Dacope and Koyra were also present at the meeting. This served as an ideal platform for the Additional Secretary to provide a comprehensive overview of the Nobo Jatra program and strongly emphasize the requirement to work in close coordination and in partnership with the Divisional, District and Upazila level administration. Overall, the Additional Secretary’s visit proved to be a tremendous boost to Nobo Jatra’s existing relationship with the Government of Bangladesh and further strengthened linkages with the Administration at the Divisional and Upazila level. Given that Nobo Jatra is dedicated to working with existing Government of Bangladesh structures, we anticipate and welcome further visits from the Ministry of Disaster and Management and Relief.